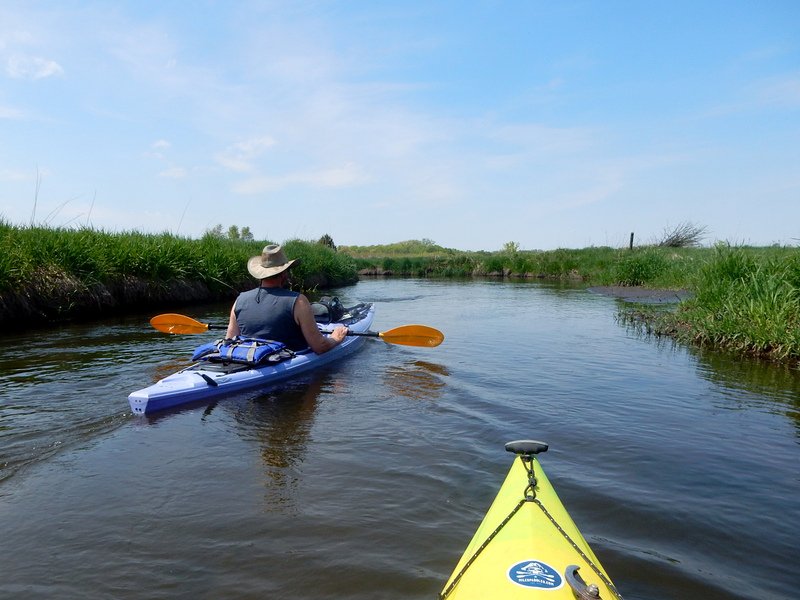 A very pleasant paddle through a mix of marsh, meadows, woods and savanna, with very little development along the way and outstanding wildlife. Accesses aren’t great, but they’re doable. Allen Creek is a fairly obscure and little-paddled stream, so obstructions will be an issue and one should anticipate portaging a few times. But we feel it’s worth it, given the solitude and novelty of it. Gauge notes: Both of these are correlative gauges for streams nearby and somewhat comparable to Allen Creek. They are not perfect indicators of water levels, however. Moreover, the dam in Evansville at Lake Leota Park probably skews conditions on the creek downstream. All that said, we paddled this trip after a dry spell of 10+ days of no rain and there was plenty of water in the creek still. Time: Put in at 1:30p. Out at 6:10p. Wildlife: Wood ducks, sandhill cranes, great blue herons, geese, turkey vultures, turkey, turtles, fish, songbirds, a water snake and dozens upon dozens of icky leeches. Allen Creek has been on our back burner for years now, given its proximity to where we live, in Madison. It’s one of those slow-down-at-the-bridge-and-wonder-what-if streams each time I’ve crossed it in a car. Add to that two protected wildlife areas along the way and a sweet finish into the Sugar River in yet a third wildlife area, our curiosity was piqued. While scouting the bridges a few years ago, I thought I’d just do a quick two-miler by putting in at County Road E, the last bridge over Allen Creek and taking out at County Road EE on the Sugar. The water is gorgeously crystal clear – the bottom lush sand. However, it’s a helluva mess and I ended up portaging some eight times in the mile or so before reaching the Sugar. So, that was out. The next bridge upstream (English Settlement Road) was none too inviting, with a farmhouse right there and cattle fences/wire within sight as well. The next bridge upstream is Highway 104, which is pretty and has OK access but there are several downed trees in plain view on the downstream side of the bridge. In other words, the Highway 104-to-Sugar River segment of Allen Creek looked cursed and that kind of curbed my enthusiasm. I don’t know why now, but my curiosity was rekindled this spring – perhaps after all the low-hanging fruit of south-central Wisconsin’s streams had been plucked while researching the guidebook. So, earlier in May I returned to scout all the bridges from Evansville to Highway 104. I really liked what I saw and so returned home to map out the different segments. So, knowing nothing more and sprung with eternal hope, we carved our way along this unknown creek, armed with loppers, a handsaw, a hand chainsaw and a whole lot of stubborn, brute determination using our own damn hands! Allen Creek begins a bit north of Evansville, in northwestern Rock County. For a dozen or so miles it flows south, then pivots west on a dime and feeds the Sugar River just upstream of Albany. All things considered, it’s a really small stream, not even thirty miles long. This trip begins at Highway 59, where there’s a make-do access on the upstream side of the bridge on river-left. Here, you’re in the heart of the Evansville Wildlife Area, a very pleasant marsh/wetlands complex. But for a barn or two, there are no buildings for the first few miles until a house at the old Highway 92 bridge and then a couple more barns again approaching the take-out. That’s a lot of little development! Steady current and easy riffles begin immediately. So does crystal clear water with a sandy bottom. The first mile is downright indulgent in the long straightaways and pleasant feeling of escape. The landscape is marshy but not monotonous (which often is the case with marshes). The creek is really intimate too, rarely wider than 20′ and often narrower than that. A few soft meanders lead to a mix of tree canopies and openness. Indeed, while paddling, we wondered if this would make a good winter trip – say on a rare sunny day in the upper 30s or lower 40s – since the current is good and the sky is open. We’ll see about that later in the year… Also, this is just the first mile. In the next half-dozen, the creek will be getting its kink on with all the meandering it does and there will be plenty of shady moments with trees (pun intended). While not hilly the way the Driftless Area or the Kettle Moraine is, there are some gentle hills along the way – first in the backdrop, then later closer up front. Near the take-out, a mile south of the river, is the totally random but splendid county park named Magnolia Bluff, a designated state natural area with sandstone rock outcrops on a blurb of land that somehow missed getting clobbered by the glacier of the last Ice Age (map here). But on the north side of the river in the same area is just the prettiest hilly savanna you can imagine (well, at least in Rock County) that is entirely undeveloped. It’s truly a remote stretch and the feeling of solitude is palpable. Finally, the last mile of this trip is utterly lovely. The creek veers away from open savanna and meanders this way and that through woodsy meadows with the occasional floodplain forest feel. Everything was just bursting with verdant greenery, ubiquitously lush. It was a remarkable diversion in the landscape, one that was totally unanticipated and made for a great ending to this altogether delightful trip. The peppy current and crystal clear water are wonderful. The narrowness and intimacy of the creek add to the charm. While the Evansville Wildlife Area is plenty pretty in its own right, our favorite sections of this trip were downstream from Old Highway 92 – the meadowy hillside that’s all blissful sun-drenched wonder and then the floodplain tree canopy portion at the end. Add to those features a truly remarkable array of wildlife sightings and happenings, we were more impressed with Allen Creek than we’d hoped to be. At the time of this writing, there are two totally non-negotiable portages. The first is around the 1.5-mile mark, where a tall telephone pole lies astride both banks. We contemplated pushing it forward, but didn’t, knowing that it would simply ensnare itself somewhere else downstream. It’s an annoying portage since you have to go over it; there’s no going around it. Calling all chainsaw angels: this one’s for you! The second portage comes a couple miles later, at a farm bridge that’s impassably low. This one’s an easy portage, however, on the left. After several thunderstorms and strong winds, one can reckon that there’s more downfall today than there was after we cleaned up what we could. Lastly, the take-out access is pretty crappy. It’s totally doable – and we’ve done much worse, but it’s a little bit of a drag – figuratively and literally. Plus the traffic along Highway 104 is weirdly busy (for being seemingly in the middle of nowhere). The put-in access isn’t great either but it’s definitely better. We’ll definitely do this again – hell, somebody’s gotta make good on all the clearing we did. This really is a pleasant paddle, especially if you live in the area and feel like you’ve exhausted the streams in the neighborhood. Plus a 7-mile trip is perfect for a lot of people. However, our next occasion will have us starting at Lake Leota Park, cruising through Evansville, and taking-out at Highway 59, just to get a sense of what that segment is like too. An extremely simple 5.1 miles along Highway 59. The put-in at Highway 59-upstream, left. Frisky riffles begin on the other side of the put-in bridge. Clear sandy water on a sunny day. The first mile of this trip goes through an open wildlife area. Allen Creek is intimate and pretty. Not all willow trees weep. The first of many obstructions we took upon clearing out. Giant telephone pole obstruction that needs to be portaged over. Back at work on the manageable obstructions. It’s always fun to see the evidence of tree clearing float downstream. Sometimes Allen Creek is really narrow. Approaching the Old Highway 92 bridge. One of SO MANY leeches we plucked off ourselves. Would it kill a tree to fall away from the water every once in a while? It’s always good to bring a strong, tall friend while paddling. Sizing up what we could actually clear. Warning: don’t try this at home. Not perfect, but at least passable now. A hilly savanna in the 2nd half of this trip is really pretty, sparse and undeveloped. Facing the farmland due south of the creek as it meanders westward. Back towards the hilly savanna. And suddenly there was a farm bridge. Fortunately, it’s an easy portage around it. Minus the deer stand, there’s just nothing out there in the savanna. Sorry Barry! At least water snakes are non-poisonous. The last mile of this trip is just really pretty and tranquil, making Allen Creek a great discovery. The less-than-great take-out at Highway 104. The right side of the bridge. A quick scamper up nearby Magnolia Bluff County Park with my dog. Somehow this sandstone outlier survived the last Ice Age. Hey, for Rock County this is as high as it gets. Close-up of other hills from the top of Magnolia Bluff. This is the stuff of the Driftless Area… surrounded by a glaciated landscape! The county park has many lovely trails.